The gift I’d wished the hardest for in 1974–the Fisher Price Play Family Village. 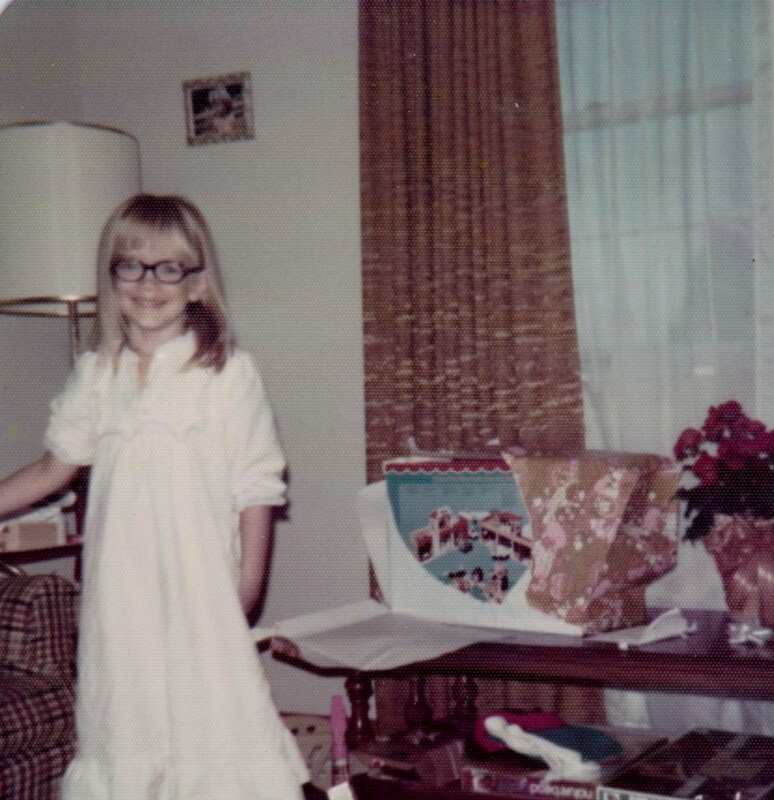 My parents captured many Christmas morning photographs when I was young, but this one from 1974 is a little unusual. Most of our Christmas photos are candids taken in the midst of our present-opening frenzy. In this one, I’m pausing to pose in front of a half-unwrapped gift. The smile on my face shows how happy I was to uncover that gift–the Fisher Price Play Family Village. Fisher Price began producing the Village in 1973. At age 6, I longed for it as intensely as I would long for the Barbie Star Traveler a few years later. I’d loved Play Family toys since I was a toddler, and the Village was the ultimate play set, with a fire station, police station, dentist’s office, apartment, restaurant, theater, garage, and more. I’ve been wanting to acquire a Village for years, but finding a complete one at a price I was willing to pay proved difficult. Finally, about a month ago, I was able to add this toy to my collection. I wanted to share a few pictures of it, simply because its colorful lithography and smiling people make me happy. As much as I enjoy nostalgia, I try not to fall into the trap of pining for a simpler time. In 1974, our country was dealing with Watergate, continued involvement in Vietnam, and an oil embargo–things were anything but simple. But a toy like Play Family Village transports me to a time when my parents still stood between me and the outside world’s troubles, and daily life seemed almost as uncomplicated as a walk down Play Family Main Street. This half of the village includes the fire station, dentist’s office, and theater. Cute touch–the apartment includes a Fisher Price record player. The box–a little worse for wear after 40 years, but aren’t we all. It must be hard to practice dentistry without hands. Off to save a cat from a tree! She’s smiling because he hasn’t given her the bill for her car repair yet. Life isn’t entirely perfect in the Village–but when frowning ne’er-do-wells strike, smiling police officers throw them in the slammer. Here’s something a modern village wouldn’t need–a phone booth. Someone’s had her doughnuts this morning. It must be hard to deliver mail that’s bigger than you are. The “entrance” to the Village’s finest dining establishment. The theater is featuring an animal act today. This entry was posted in Collectibles, Toys and tagged 1970s, Christmas, Fisher Price, Little People, Nostalgia, Play Family, Toys, Vintage Toys. I remember these vividly! Lovely post. Thanks–glad you liked it. I always enjoy your blog. Flippin awesome post. These were such great toys. Now.. kids play with fisher price characters via xbox and computer games. Oh yeah.. and I always loved that black and white dog. My 9-year old still likes playing with my old Fisher Price stuff. She would never admit it to her friends, though. Thanks, glad you enjoyed the post. I do think Fisher-Price still makes high quality toys. As a parent, I was kind of disappointed by the 2007 Mattel/Fisher-Price lead paint situation, but, then, who knows what was in my old toys? They didn’t start regulating lead content until 1978, apparently. Mostly, I think it’s sad that kids outgrow toys so much sooner these days. Thanks for the thought-provoking comment! This might be off topic, however, i dont play with them but i really love them especially the Bratz dolls. and im trying to find the fisher price loving family doll house and put it alongside a 18 room miniture dollhouse i built some time ago.Im asking this question because as i get older my love for these things grow and i love to spend time adding to the different rooms. Ive been told that im trying to regress back to my childhood but i dont think so, considering i had a pretty nice childhood and i had a dollhouse then, but through this question i just wanted a different opinion. I still have my FP village. I remember writing a composition in grade 3 stating I wanted this for Christmas. My parents kept it and all the grandchildren played with it when they cam to visit. We were always cautious around the little people though. A boy around the corner swallowed one of the little people and it got stuck in his throat. He was mentally and physically disabled as a result. They successfully sued FP. It is because of that incident that the little people became chunky people.